The strong bond that the two share is no secret and the actor is also rumoured to launch Shera's son, Tiger, into Bollywood soon. 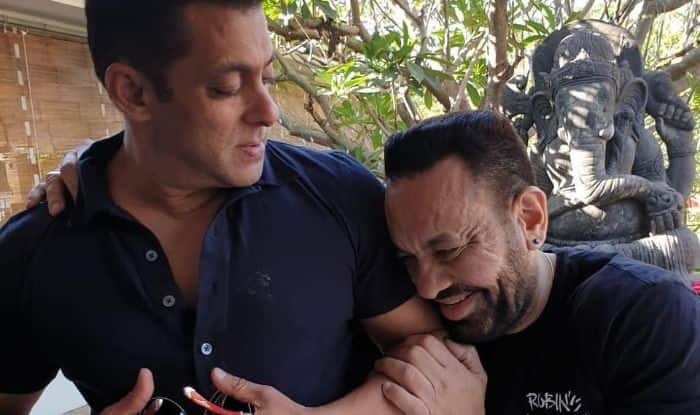 Birthday boy Salman Khan‘s trusted bodyguard Shera was with him throughout when the 53-year-old actor cut the cake today as the media sang the birthday song for him. Squeezing some time out, Shera took to Instagram to share an adorable birthday note an hour ago, for the Race 3 actor, that gives further insight into their already evident strong bond. In the picture set in a courtyard background, Shera is seen semi-clinging, semi-hugging Salman who looks at him with a lovely expression on his face. The two machos are seen donning navy blue T-shirts with a huge Ganesha idol in the backdrop. Shera captioned this brotherly-love dripping frame as, “Happy Birthday to the man, who I owe everything in life @beingsalmankhan. Love u Maalik #salmankhan #Beingshera #Shera” (sic). The strong bond that the two share is no secret and the actor is also rumoured to launch Shera’s son, Tiger, into Bollywood soon. Salman had even dedicated his 2011 film, Bodyguard, to his personal bodyguard, something that Shera is eternally grateful about.